Want just a quick summary? 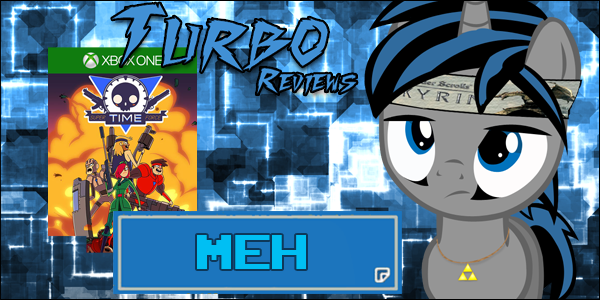 Go to the Final Verdict below for that and my rating! 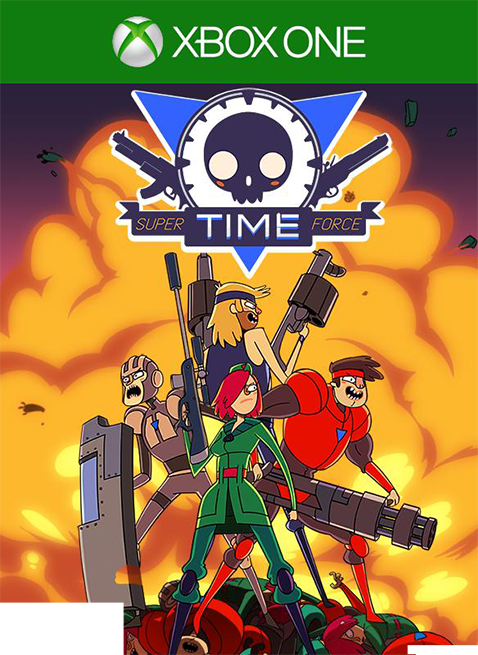 Super Time Force starts out very promising. 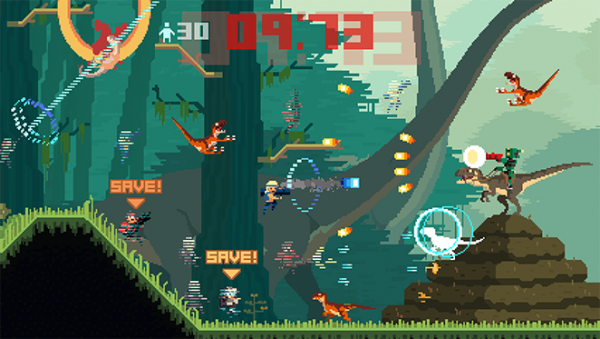 It is a very retro style 2D shooter game with a neat time bending twist. While these retro games lately have kinda bothered me, I thought this one might be genius. Actually...no, at least, not entirely. 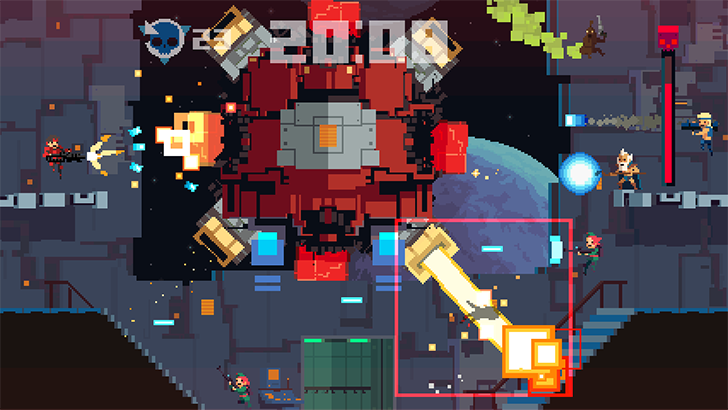 As I said, it is a retro 2D shooter. 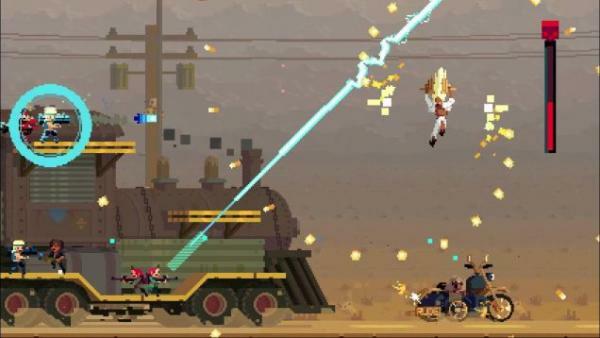 You move about in a very pixelated and colorful world and you shoot things. Sounds simple enough, but there is a catch: you can control time! With a simple click of a button, you can 'Time-out' and reverse time a good length. Then, you can start at any point, and your past self will play back all of the action that it had just experienced and you keep playing. This creates a sort of single player co op play, as the game calls it. You use this mechanic to take down tough enemies and to defeat bosses. When you time-out you also reveal little short power ups to help you along the way when they are shot, like one that slows down time. I like these but they can be hard to spot and hit due to the chaotic gameplay. While this system works fine, the game is very chaotic. You die in one hit. With that, you will be rewinding a lot. You get a lot of lives to do so, but you will still die plenty of times. The gameplay is very frantic. Bullets will be flying in so many directions during the game that it is insanely hard not to get killed during sections. You can keep rewinding to your hearts content if you have the lives and you can do this until you eventually kill the enemy, but this feels like tedious trial and error thanks to the sheer chaos. At times, this game is definitely a bullet hell game, a genre I have never enjoyed. The games control is tight and works well, except aiming can be a bit finicky and stressful. To add further to the chaos, there is a timer in each of the stages. Each stage you have 60 seconds to get through. Seems terrible huh? Well, you can collect time extenders a long the way. These extend the time slightly but even with these, the time limit adds just way too much tension to complete the levels. It almost feels like you have to speed run through each level just to get through. Which will of course result in further deathification. This timer definitely goes with the theme, but I really wish this was a bonus mode for the game rather than a major mechanic. The game would be far more enjoyable without this mechanic. During the game you start with 3 characters that each have their own special abilities. You can shoot normally by tapping the X button or charge the shot by holding it down. Doing so will do the character's special shot, like shooting through a wall or shooting a spread shot of bullets. Throughout the game you will find many additional characters that each have their own abilities, which these can all be chosen when you time out. This is one of the best parts of the game, it is fun experimenting with each character to see how they can handle a scenario and then timing out to try another while your past self wreaks havoc. One aspect of the game that bothers me is the humor, while there are some funny little references to past games and movies, the humor overall really comes off as forced a lot of the time and it just gets annoying and cliched. I am all for making humor a centerpiece of a game, but only when it is done well. Here, it isn't much. It comes off more as a kind of 'bro-dude' sense of humor. It made me chuckle at parts but it is very hit or miss. You may like it more than I did. The last thing I will mention is the graphical and music style, which are both very retro.  This has been a popular style lately and while the music is quite good, I found the graphical style to be a bit...off. As a retro look it does work but even then it sometimes feels way too blocky but some of the enemy designs fair quite well despite this. In comparison to another recent retro game, Shovel Knight, the graphics here work, but they are hardly memorable. 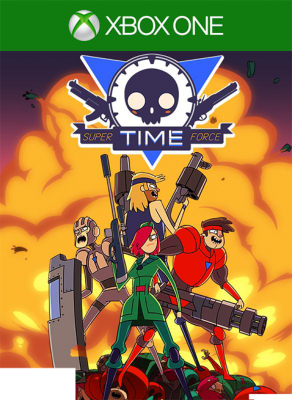 Super Time Force is a game that tries way too hard. It has some really cool ideas that actually do work well at times but it goes a bit too far with its time mechanics. The timer in each stage adds a bit too much stress and is non-optional and the humor fell flat for me most of the time. The game does have good music and controls well minus some aiming problems and the variety of different characters make the game worth playing through at least once, but I don't see myself doing so again. It isn't a bad game by any means, it just needed some major tweaking in a few areas. The game isn't insanely hard, it is just overly stressful. Second review of yours that ive read. Nice work! Nice..... i should get my buddy to hack a rom and put in onto an SNES cartridge.